A bus carrying off-duty soldiers has been hit by an explosion outside a university in the Turkish city of Kayseri, leaving 13 people dead and 55 wounded. According to Interior Minister Suleyman Soylu, who was speaking at a joint news conference with the health minister, all of the injured are being treated in hospital, with 12 in intensive care and six in critical condition. Turkey’s General Staff said earlier that 13 people had been killed in the explosion. According to Soylu, eight of them have now been identified. Seven people have been detained in connection with the explosion, Soylu said, as cited by Reuters. He added that the attack had been “carried out by a suicide bomber.” There has yet been no claim of responsibility for the bombing, but Turkish President Erdogan issued a statement claiming that a “separatist terrorist organization” is responsible for the attack. Turkey’s deputy prime minister, Veysi Kaynak, earlier said that it is highly likely that the incident is a terror attack reminiscent of the explosion at Besiktas stadium, adding that it appears to have been caused by a car bomb. 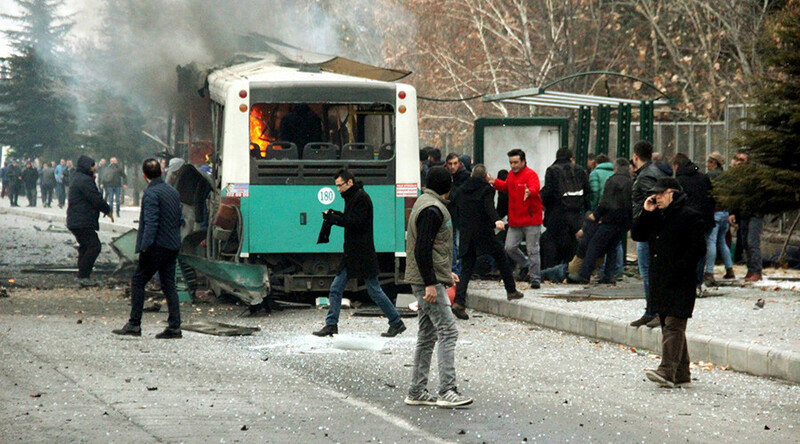 A witness cited by Haberturk claimed that a car near the bus exploded. Speaking to reporters live on Turkish TV, Kaynak said that the attack had targeted a bus carrying off-duty soldiers. Saturday’s explosion comes only a week after a twin bombing outside an Istanbul soccer stadium killed over 40 people and wounded more than 100. That attack was claimed by Kurdish militants.